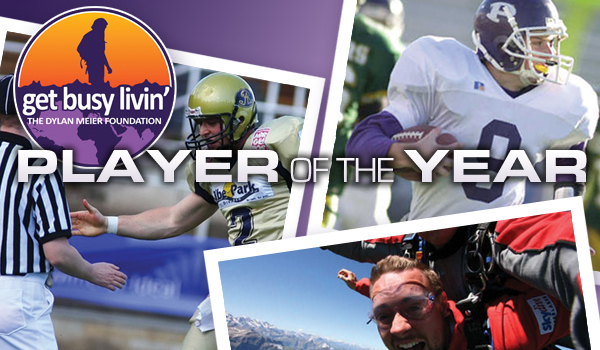 Kpreps is proud to announce the 8th Annual Get Busy Livin' - Kpreps Player of the Year Award promoting The Dylan Meier Foundation. The annual award honors one Kansas senior who not only has shown excellence on the field, but has also demonstrated the values that Get Busy Livin' (GBL) strives to promote: adventure, fitness, curiousity, generosity, and a daily zest for life experiences. Nominations for the award will be accepted through December 14, 2018. Finalists will be selected by a committee made up of GBL and Kpreps representatives. Finalists will be featured on Kpreps.com and the winner will be presented the award at a school function in 2018. To nominate a player, send your nomination form to gbl@kpreps.com. Dylan Meier, a 2002 graduate of Pittsburg High School, was a two-time All-State quarterback for the Purple Dragons. He continued his football career at Kansas State and started 11 games from 2004-2006 as the Wildcats' signal caller. On April 19, 2010, Meier died in an accident while hiking with family in Arkansas. In addition to his time in Kansas, Dylan played professional football in Germany and Italy, served as a bodyguard for Italian fashion models, worked in a vineyard overseas, ran with the bulls in Spain, and went skydiving in the Alps. His next plans included coaching football in Europe, teaching English in Korea and possibly a return to Kansas State as a graduate assistant. That zest for life is the basis of the Get Busy Livin’ Foundation that was established in Dylan’s honor. The mission is to provide support for individuals and groups that embody the values that Dylan pursued: adventurer, fitness, curiosity, generosity, and a daily zest for life experiences. The GBL Foundation is determined to breakdown the boundaries that keep people from living life to the fullest, whether those boundaries be social, economical or imaginary. The GBL Foundation will use donations to promote these values in the following ways: student/athletic scholarships, sport camp sponsorships, student travel abroad scholarships, community service needs and other activities that inspire and build character.